Is your mind in another era, more than our own? Historical Fiction is the ultimate reward! Writing historical fiction but getting bogged down in the research? 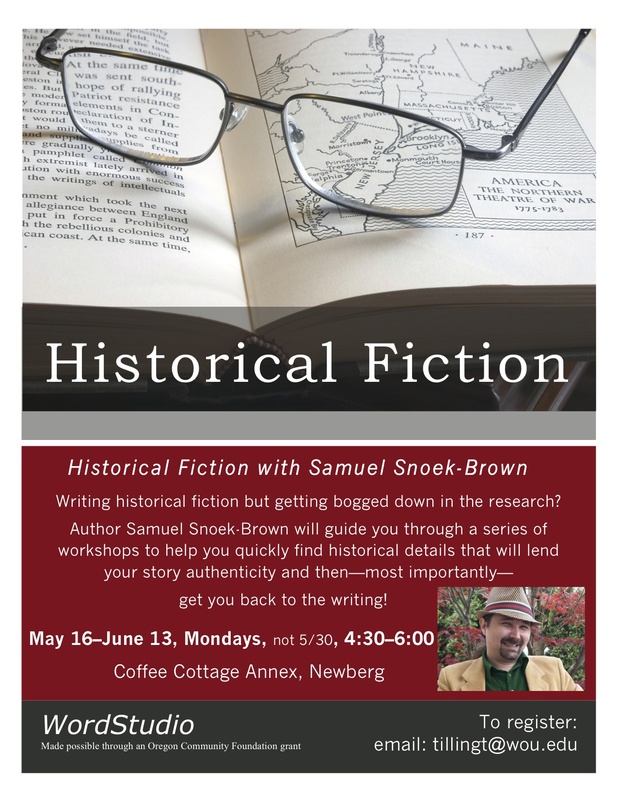 Author Samuel Snoek-Brown will guide you through a series of workshops to help you quickly find historical details that will lend your story authenticity and then—most importantly—get you back to the writing! Samuel Snoek-Brown lives in Portland and teaches writing at Chekemeta Community College’s Yamhill Valley campus. His work has appeared in dozens of literary journals, and he serves as production editor for Jersey Devil Press. He’s the author of the chapbooks Box Cutters and Where There Is Ruin, as well as the historical novel Hagridden, for which he received a 2013 Oregon Literary Fellowship. Register now for Historical fiction Registration Form Simply print out the form and mail it in with your check. ← Terroir Creative Writing Festival happening this Saturday!